I arrive just before my CT is to pick up her students from lunch recess. I really like that we have a moment to connect before the afternoon begins. Here she and I discuss the plan for the afternoon and I can ask any questions that I may have. I have found this beneficial to my observation and participation in the classroom. I will also add, I feel as though I am valued by my CT. Whenever we are walking down the hall or a staff member comes into the classroom, my CT introduces me with a smile and says "this is my 3309'er." The cute kitten played tag with the music. Students are graded on the correct spellings; as well as the capital letter at the beginning of the sentence and the correct punctuation at the end of the sentence. I found this to be a great way to assess students in their spelling and writing skills. While the students were at block today, my CT graded papers, assisted me with our classroom demographic chart, and created an invention for students to participate in an afterschool STEM club. Going over the classroom demographics helped me in getting to know the students better and finding out what students are in need of special accommodations with an IEP or 504 on file. I will need to keep this information in mind while planning my lessons and delivering them to the class. In Response to Intervention (RTI) the students finished up traveling brochures that they began yesterday afternoon. This writing activity had them explaining where they wanted to travel and why. When the students were finished, they constructed a structure out of legos for the place they chose. For example: one student created a travel brochure on Hawaii and then created a large wave out of legos! Learning is busy and noisy. I just love that my CT allows the students talk to their classmates while they are working (when appropriate). The students have multiple conversations while completing the assigned task in addition to discussing what they are creating and hope they plan on finishing it. The CT allows the students to talk to those around them; however, not to yell across the room. This seems to work quite well. I believe that if my CT were to try to control the students into not talking they would have a difficult time staying on task. The students are active in their work, looking around the room to what other students are doing and want to know what it is that they are creating or how they did it. When they were finished, my CT asked a few of the students to share with me their travel brochures and lego creations. When the class was back together again after last recess, my CT began a writing activity with the students. Next week, they will be writing an opinion piece about cats and dogs. First, the explanation of what an opinion was; it is how you feel about a topic. My CT stressed how important other people's opinions were and that it is easier to understand them when they have reasons why they have them. My CT used the document camera so the students could see her begin filling out the graphic organizer (pictured below) they will be completing today. 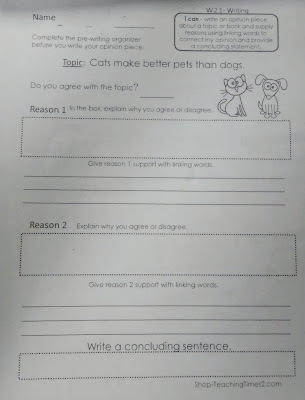 The students are to decide if they agree or disagree with the sentence: Cats make better pets than dogs. 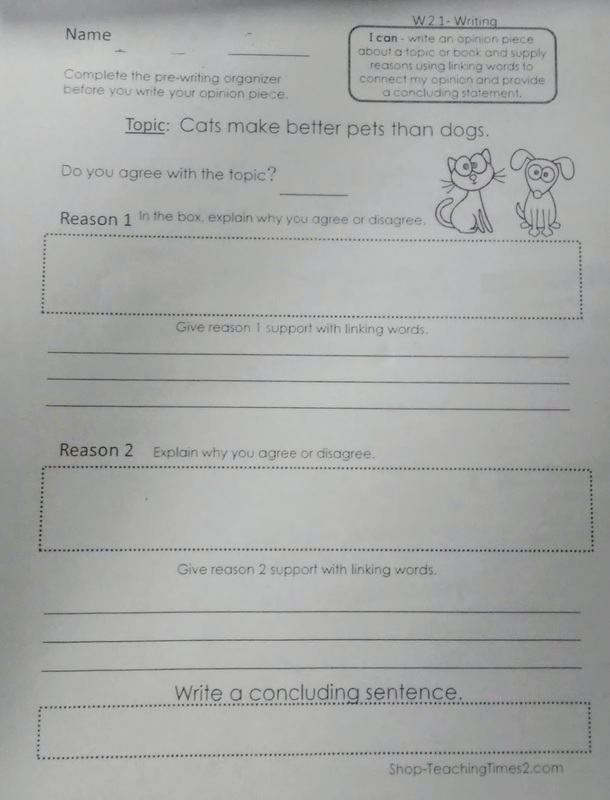 Then, they are to write two reasons why they chose their response. While the students were writing, I left my observing post and began to participate in the learning in the classroom. I first started walking around and looking at what the students were writing. My CT was working with individual students with reading fluency and hands began to raise. So, I jumped in and started answering their questions. As I continued to assist students with spelling difficult words, I noticed a student (who has difficulty staying on task) coloring. I asked him where his paper was and he said it was in his desk. I asked him if I could see it and he said yes. The graphic organizer was completely blank. He said that he was tired and did not feel like completing it today. He would do it on Monday. I suggested that he started by putting his name on it, just in case it got mixed up in other papers and we wouldn't know whose it was. So he put his name on it and tried to return to coloring a picture. Then I asked him what he thought about cats and dogs, which one made better pets. He said dogs; so I led him through the first question and he wrote no on the line. He picked up his crayon and tried coloring again. He said, "I am kind of a trouble maker, I do not follow the rules." I said, "I noticed and wished that he would at least tell me why he thought dogs were better pets than cats." He began mumbling a list of ideas of why he disliked cats. I let him know that this is all that he needed to write down on his paper and he would be done with what he needed to accomplish today. I reminded him that if he did it today he would have less to do on Monday. He asked me to look at his picture that he created. I told him I would as soon as he wrote his thoughts on paper. He quickly wrote the reasons on his paper and his assignment was finished! 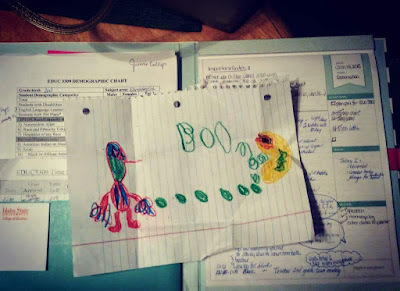 He showed me his drawing, folded it up, and said he made it for me. I thanked him for the picture and for completing his work. He smiled. This student has a difficult time staying focused, I believe that assignments may overwhelm him to be completed in class in just a short time. Instead of trying to do as much as he can, he would rather not do it at all. I took a chance at him doing it one section at a time and within minutes it was completed! The end of the day routine began and the school day ended. I was so tired when I walked into the classroom today, but as I headed out I had a little pep in my step. Moments like those and pictures from students make all of the running around from campus to the elementary school, quick lunches, all the reading, all the writing, and lack of sleep completely and totally worth it.